Draw out-follow by foot-devise-plan-map-score-trace-ponder-delineate-investigate-look for-discover-experiment-pursue… These etymological roots and routes of trace making are ever so present in the ways in which we practice our research in the arts, humanities and the social sciences. This year we would like to invite you to apply to our 2nd biannual “Arts in the Alps” Doctoral Spring School entitled MAKING MARKS, LA FABRIQUE SENSIBLE DES TRACES that will address the traces that are materialized with and through practice based research experimentation. This event follows the successful 2017 school which took place at the Magasin art centre and brought together students from 12 countries. 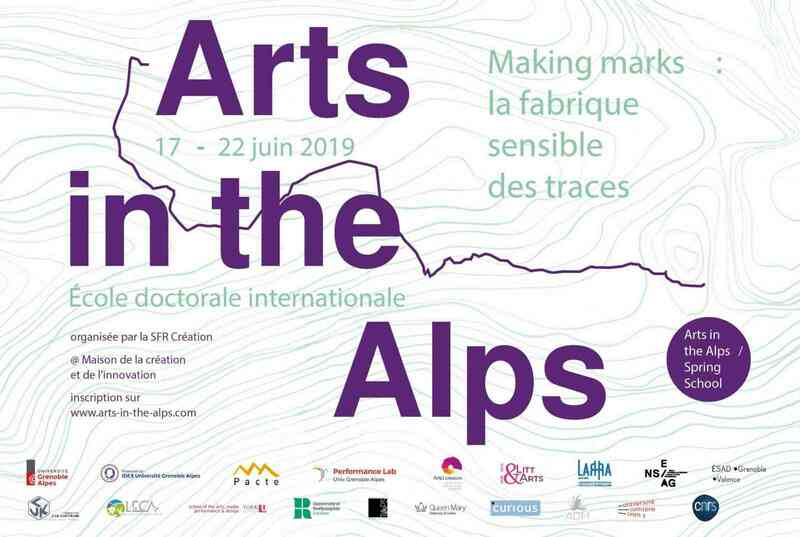 The Arts in the Alps 2019 Spring School will bring together a vibrant community of researchers and artists from the arts, humanities and the social sciences (or art, dance, geography, computer science and performance) to explore and experiment the ways in which sensorial becomes material within the context of practice based research. During this weeklong event we aim to focus on the ways in which material traces are made through and for artistic research and in turn can be shared across international communities. question how traces become artefacts which are shared across interdisciplinary and scientific communities. how the materiality of artistic practice can be used as a reflective tool? how the physicality of creative research artefacts move beyond the performative moment of making? how perceptual traces or artefacts can be shared between different scientific fields? Throughout the six-day intensive doctorate school, the attendees will have the opportunity to participate in different workshops and seminars. These include daily movement practice, performance experimentation, creative writing and map making workshops led by an international group of researchers and artists. This year the event will take place in the new Maison de la création et de l’innovation (MACI) our new building on the University of Grenoble Alps main campus and as well as in surrounding sites. Our new facility has specialized spaces for making and documenting practice based research and aims to support the ways in which the arts, humanities and the social sciences produce research in terms of process and product.